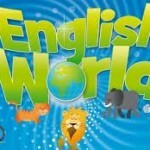 This book is for Level 1 children who have had some exposure to English and are beginning to read and write. It is brightly coloured and has eye-catching, easily navigated pages reminiscent of a child`s puzzle book. There are 12 units, each divided into four sections: grammar and grammar in conversation, reading and reading comprehension, listening, and writing practice. Each unit provides opportunity for grammar and dialogue practice using real-life scenarios and everyday language. The tasks are short and varied allowing for the short concentration span of children, and are depicted by colourful cartoon characters and drawings. Instructions are clear and concise. Topics covered are subjects of particular interest to children eg. ‘space’, ‘my room’ and ‘fast and slow’. The children are also encouraged to work on projects. They draw, write, read and say their finished work. The reading and grammar tasks are linked to listening and speaking tasks (eg. Listen, read and say), and reading is checked with comprehension questions (eg. Read and write – yes or no). There are also regular revision pages checking comprehension on completed units. The book comes accompanied with a grammar practice book and dictionary, and is complemented with electronic materials for use with an interactive whiteboard; all dialogues, using native speakers, are on video. There is also a complete teacher training package. This is an excellent workbook, which, I believe, will attract children and hold their interest. Every page is exciting, encouraging children to learn.